Made from 316 Stainless Steel, these gas struts are suited to exposure to harsh environmental conditions and will not rust or corrode. Surfaces are specially treated for additional hardness. 316 stainless steel provides the high cleanliness and corrosion protection required for salt water/marine applications, medical, chemical and food service industries. Our fixed force gas struts come in standard force steps, up to the maximum of the strut. These are ideally suited to applications where the weight to lift is consistent. If your application requires a specific force we will manufacture to your requirements and hold the stock for delivery, when and where you need them, just-in-time. Do You Know What Force You Need? 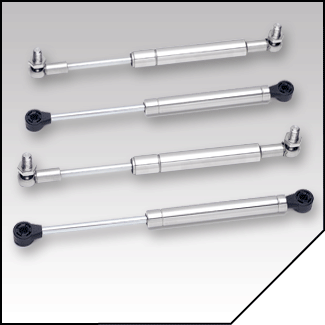 Why Choose Adjustable Force Gas Springs? 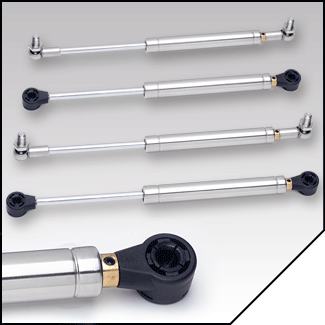 Our Varilift gas strut is a user-adjustable version of the Standard Stainless Steel Gas Strut. A brass bleed valve is fitted to enable the user to adjust the P1 force of the spring. Each size is pressurized to the maximum available P1 force for that range. Once installed, the adjustment may be made without removing the strut, saving considerable time and effort. This is ideal for prototyping new applications and those which cater for varying weights. Gas struts and dampers have seals. In order for the seal life to be as designed the struts must be installed in the proper orientation. For whichever position is most often occurring in the application, the rod end of the strut should be installed lower than the body. This helps keep oil on the seal for lubrication purposes. For example; if a hood spends most of the time closed, it is important the rod be lower than the body in the closed position.